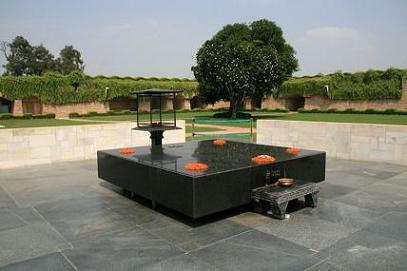 Raj Ghat is a memorial to Mahatma Gandhi. Originally it was the name of a historic ghat of Old Delhi on the banks of Yamuna river. 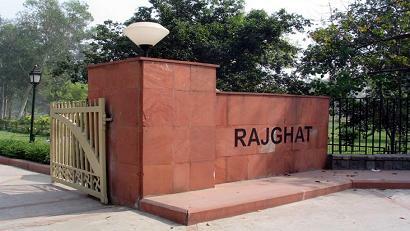 Close to it, and east of Daryaganj was “Raj Ghat Gate” of the walled city, opening at Raj Ghat on Yamuna River. 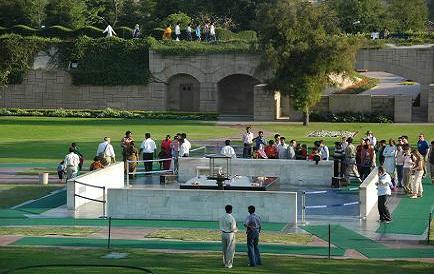 Later the memorial area was also called Raj ghat. 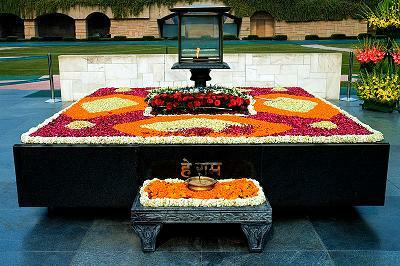 It is a black marble platform that marks the spot of Mahatma Gandhi's cremation, Antyesti (Antim Sanskar) on 31 January 1948, a day after his assassination. It is left open to the sky while an everlasting flame burns perpetually at one end. It is situated on the banks of the river Yamuna in Delhi in India on Ring Road officially known as Mahatma Gandhi Road. A stone footpath flanked by lawns leads to the walled enclosure that houses the memorial. 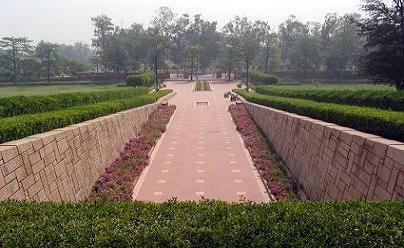 All guests must remove their footwear before entering the Raj Ghat walls. 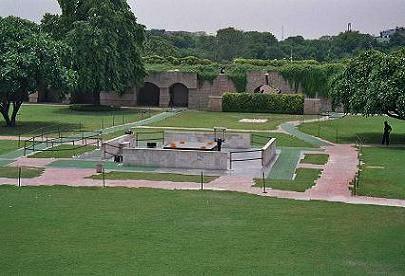 The Raj Ghat is situated to the southeast of Red Fort, between the Yamuna and the Ring Road. It is the memorial to the Father of the Nation, Mohandas Karamchand Gandhi. 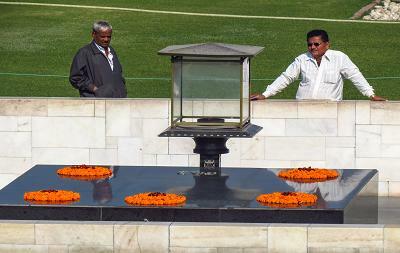 The Mahatma was cremated here on 31 January, 1948. Raj Ghat is a National Memorial. A stone walkway, with well kept lawns on either side, lead to a walled enclosure open to the sky, with a stone platform in black marble marking the site. Raj Ghat loosely translates to King's Bank (where King alludes to the importance of the place and Bank as in -on the bank of river Yamuna). 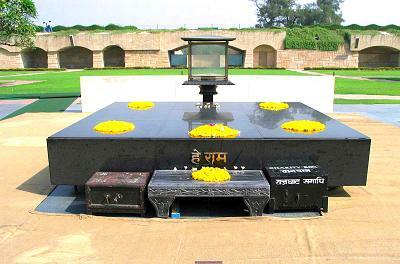 Various other samādhis or cremation spots of other well-known leaders can be found in the surrounding area of Raj Ghat on the banks of the Yamuna. The planting and landscaping of these memorials was done by Alick Percy-Lancaster, the last Englishman to hold the post of Superintendent of Horticultural Operations, Government of India. 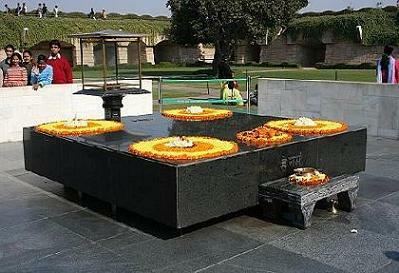 Jawaharlal Nehru's samadhi is to the north of the Raj Ghat and is known as the Shantivanor Shanti Vana meaning the forest of peace. The area has a park decorated with trees planted by visiting dignitaries and heads of state.